The next home decor trend has arrived and it's all about surfboards. Their popularity has grown over the years, with Beyoncé making a risqué term out of the word, Kelly Wearstler turning Pacific Coast boards into works of art, and surf stores opening up in even the most unlikely places, like New York City. The boards are a nod to California surfer style which is all about being effortlessly cool. And these spaces are just that. Cool and collected, with surfboards acting as the ultimate statement piece in each room. 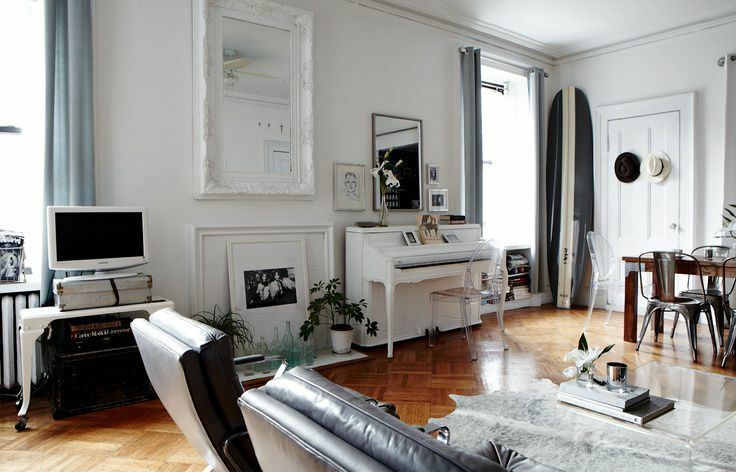 Take this black and white living room for example. A surfboard is used in such a unique way, carrying the color palette through as a decorative object. Standing in the corner of this space, the surfboard is used to add a casual note to this classic interior. Surfboards can be spotted everywhere in some of the coolest interiors. Here, this office features a large surfboard in a sophisticated white that goes well with the decor of this space. These boards can also make a great statement piece in the smallest of spaces. A small nook takes on a sporty vibe in this interior with a black surfboard and skateboard in the corner. Surfboards are great for adding a little color too. We love the mix of pink flamingoes and a navy blue board that adds to this living room's color palette. A cool collection of pastels looks even better with some very pretty boards added to the mix. A surfboard in the dining room? Well, why not! Here it works well in a cool sea foam green that adds to the relaxed, outdoor vibe of this dining area. There are so many fun ways to display surfboards at home. Sometimes they are tucked in the corner, or just hanging out behind a sofa or chair. Here, this paneled entryway has made special room for boards to be stored. The open cubby still allows them to be on display, a cool part of this home's decor. Polkadot surfboard anyone? Boards in fun patterns can be displayed at home to add a little whimsy to a room. This black and white surfboard melts into the room's color palette, and fits with the sophisticated sports vibe of the space. The white polkadots add a fun and unexpected touch to the decor. An old, vintage board can be just what a room needs to pull together a theme. We love this black and white board with a hint of red, and how well it complements the display of LIFE Magazine photographs in this bedroom. A room never looked so surfer chic.